I want to start off by saying I haven’t read any of The Dark Tower tales. 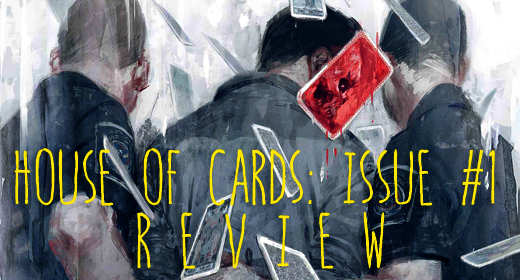 House of Cards #1 (HOC) is my first time diving into Mr. King’s Mid-World, and it may not be my last. When I first opened the pages of HOC – written by Peter David & Robin Furth, with art work by Piotr Kowalski and Julian Totino Tedesco – I felt like I was turning the pages to a Stephen King book. The set up felt like a novel, and the flow of the story made you feel like this was its own universe and not just a point in time pulled out of the Dark Tower. I didn’t feel lost or confused. I’ll admit, though, when I read “Eddie encountered a sinister man in black, a mysterious cowboy, and a grey beach crawling with giant lobster beasts,” I thought, “here goes another weird comic just for the sake of being weird.” However, I pushed through and found myself pulled into the crazy tale of Eddie Dean; I’m still wondering what’s gonna happen to him next. Eddie is a young drug runner for the local mob boss, and he is pulling one last job in hopes of getting enough money to get his brother and himself into rehab. Sadly, everything starts to go south (or whatever direction Mid-World is). While Eddie is on a plane heading to New York, he starts to see visions of another world and the door that will take him there. When he panics, the flight crew takes action and the next thing Eddie knows he finds himself locked in the bathroom at 30,000 feet – deciding if he wants to walk through the mysterious door or take his chances with the Air Marshall. With the large amount of drugs Eddie has taped to his chest it’s really no surprise what he decides to do. I enjoyed taking a look into Eddie’s world; the artwork was well done and lets you understand that Eddie is a young boy stuck in a confusing situation, and that just made you feel for the kid. Eddie reminds you of the kid next door who’s always getting in trouble, like Shawn without the fun loving Cory of Boy Meets World. Now don’t get me wrong, I do want to find out what happens next, but I’m not invested enough to put it into my pull list, and the overall story itself felt rushed. The whole airline event felt like it was only a few minutes, meaning the story very could only be two hours of Eddie’s day. HOC goes for $3.99 and only a five part run, meaning it will be done in a month. I’d pick it up if I saw it in the shop, but if I didn’t, I really wouldn’t feel like I’m missing out. I would suggest the $1.99 download off of Marvel.com or wait for the release of the trade. Have you heard the latest episode of the JustUs Geeks podcast? It’s about comedy! Listen to the episode here!